Are you hosting a special concert? Maybe you’re gearing up for Vacation Bible School, starting a new ministry or Bible Study, or providing a community outreach. Get the word out about your special event with our Church Calendar! Join Faith Baptist Church for an Easter Sunday Service with a meal and egg hunt to follow. 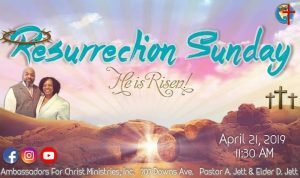 Join Ambassadors for Christ Ministries for their Resurrection Sunday Service starting at 11:30am.